Who doesn’t love a good play on words. Especially the subtle witty kind that sneaks up on you. I had a great stay at the Liberty Hotel a few weeks ago (I’ll tell you more about that later). 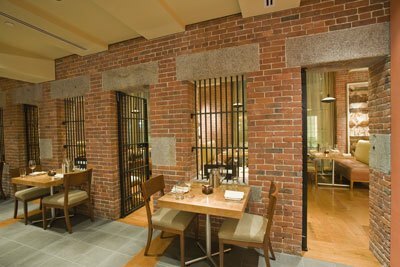 The hotel was renovated a couple years ago from what was previously the Liberty Jail. If you don’t need accomodations and just want to experience a fantastic meal than stop by Clink Restaurant. It is also a great place for cocktails from Thursday to Saturday. It is one of the places within the renovated space that has some of the obvious details left over from the jailhouse. In fact, where I sat munching on a delicious 3 cheese grilled cheese sammy could of been the same place that Malcolm X was kept behind bars. It would be worth a walk through Boston Gardens and up Charles Street for a special experience at Clink. Very cool! I would love to visit, the renovations leaving some of the jailhouse details is just so unique.